When it comes to learning a new language, many people stop at the surface level of simply learning to speak and understand the language. The ability to write and read new languages is often a task reserved for academics and research maniacs. It is deemed too difficult and time consuming for the average Joe, who is often just seeking the ability to speak to locals of a new and unexplored region. When it comes to learning Chinese, the question of whether or not it is necessary to gain both verbal and written skills in the language is a complex one. Because the Chinese language is expressed in characters and is almost indistinguishable from the larger Chinese culture, lovers of the language must reasonable invest time and effort into understanding written and verbal Chinese communication. Committing oneself to the task of learning both written characters and the verbal expression of the Chinese language can be taxing. After all, adding Chinese characters to a language program can increase the overall time consumption of the task. Attempting to understand and write Chinese symbols leaves little room or creativity for the task of learning to craft sentences, adequately understand grammar, and develop other basic language skills that are useful to the student. Those students who are considering education in the Mandarin language must account for the fact that one’s beginning level of Chinese understanding has a very minimal impact on his or her adaptation of the Mandarin language. The question of whether or not learning Chinese characters have an impact on an overall adaptation to the Mandarin language is one that looms over many new students. Students often finding themselves asking, “Why learn Chinese characters in the first place?”. Beginning Mandarin students should understand that it is most important for them to develop skill in tone control, basic and intermediate vocabulary, sentence structure, tense changes, and the like before the development of Chinese characters is really necessary or useful. Chinese characters are simply not a relevant part of the beginner’s process. In the same manner that a toddler learns to lace words together to form sentences and is speaking fluently in their own language well before reading material is introduced, new Mandarin students will greatly benefit from listening and speaking the language with minimal reading and comprehension. After the brain adapts to the speaking and listening portions of the language, learning to write and read Chinese symbols will come with relative ease. Beginning Mandarin speakers may not be pleased with the absence of Chinese symbol in educational materials because reading the language is beneficial for cultural purposes. But they must remember that it is much more beneficial to focus on the oral development of the Chinese language. The skill will be grasped quickly when the primary focus is the language. After the student has sufficiently developed a fluency in the spoken language, they may run into additional problems that are unique to Mandarin. Becoming fluent in a language before learning to write or read it well can present its own set of difficulties. These difficulties are compounded by the fact that there are around 400 possible words in the Mandarin language. Additionally, there are four tones that these words can be spoken in, which creates an estimate of about 1600 word possibilities. Those who are experts in the Mandarin language estimate that only a portion, or about 1200, of these word variations are used with any regularity among Mandarin people. Even still, a word variation of about 1200 commonly used words can be intimidating for a student who hasn’t yet learned to write and read the most basic words in the language. As an example of the difficulty provided by the specifications of the Mandarin language, students can observe the word/ syllable, “shi.” This syllable has more than 25 characters that can represent each of its letters and this number is multiplied by the four possible tonal pronunciations of the word. Each variation yields a completely different meaning in Mandarin. This makes it very difficult for the fluent student who speaks the language to properly communicate a familiar word in writing. Without properly understanding the Chinese symbols, students would be required to memorize, distinguish, and mentally organize several hundred possible word combinations and meanings, a feat which is highly unrealistic. Because of this difficulty in learning the language, students often progress very quickly in spoken Mandarin and maintain that progress until they reach an advanced level where learning the Chinese symbols is required to continue. At this point, many students become stagnant in their developing language skills or they decrease in skill altogether. To avoid the potential frustration of going back to square one and learning the Chinese symbols after already becoming fluent in the language, it may be best for some students to be introduced to the Chinese symbols during their original introduction to the Mandarin language. If the student is able to handle learning both the Chinese symbols and the spoken language at the same time while gaining steady progress, then the two facets of the language should be taught together. If the student is not making progress with the skills simultaneously, then one should be taught at a later time. Because of these complexities in learning the language, I would recommend that students seriously assess their purpose for wanting to learn Mandarin. Students who show no interest in developing reading and writing skills along with reading should, specifically, be asked to evaluate their purpose of learning the language. If the student’s goal in learning the language is to simply survive during a short visit to China and they do not wish to ever become fluent, education in Chinese symbols may not be entirely necessary. It is perfectly reasonable to learn only spoken Mandarin for this purpose. Students who have this goal can focus on the development of various sentence patterns and proper pronunciation to communicate efficiently with locals. This is time well spent. Learning the spoken language without the interference of Chinese symbols can increase the student’s progress and prepare them quickly for their journey to China. 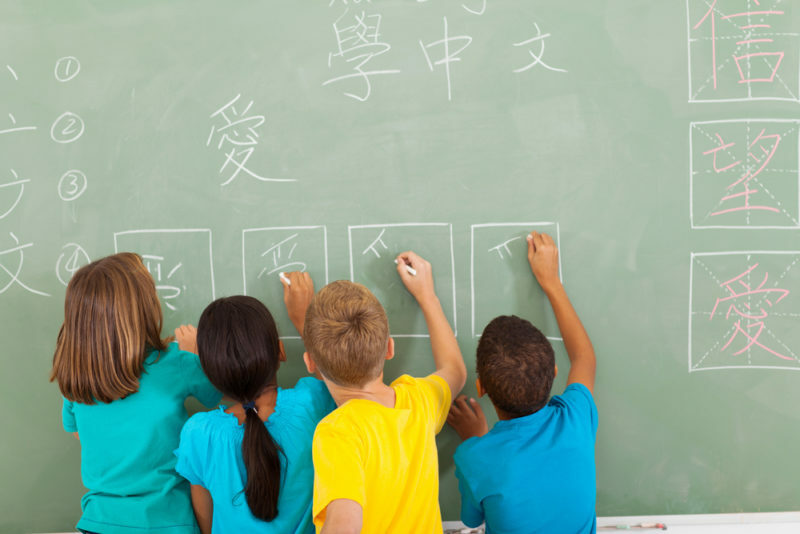 If a student’s goal is to become fluent in the language, however, they must be advised to introduce Chinese symbols into their study as quickly as possible. This can help them avoid frustration later on in the educational process. Not only is it helpful to the student seeking to master the language to be exposed to Chinese symbols early on, but learning the skills together saves them time and generally keeps them from giving up on the language due to burnout.